2019 is going to prove to be a unique year with regard to camping in the Jemez Ranger District of the Santa Fe National Forest. 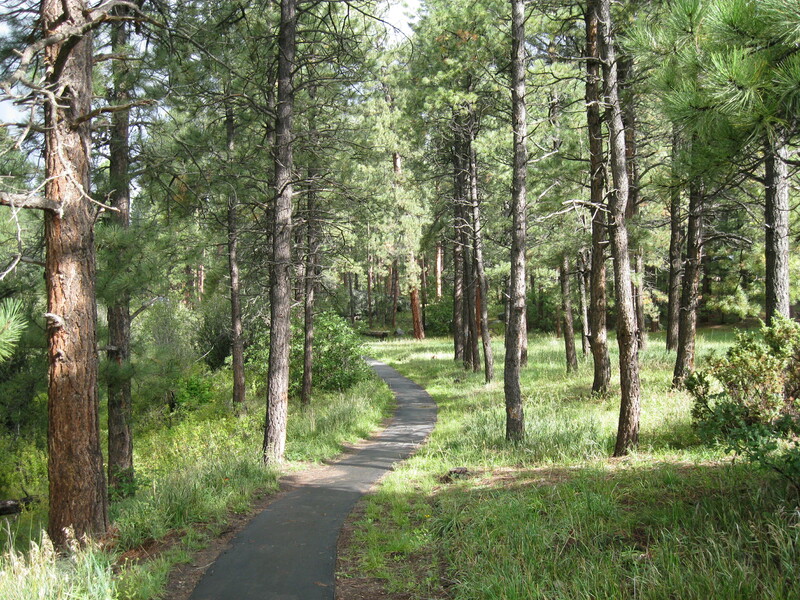 Here are the many changes to consider before heading out for a camping excursion to the Jemez. 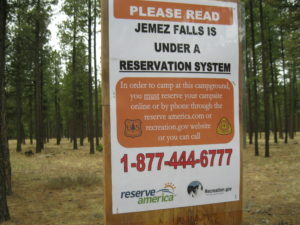 Both San Antonio and Jemez Falls Campgrounds are reservation only. (https://www.reserveamerica.com) There will be no first come, first served at these two popular campgrounds. 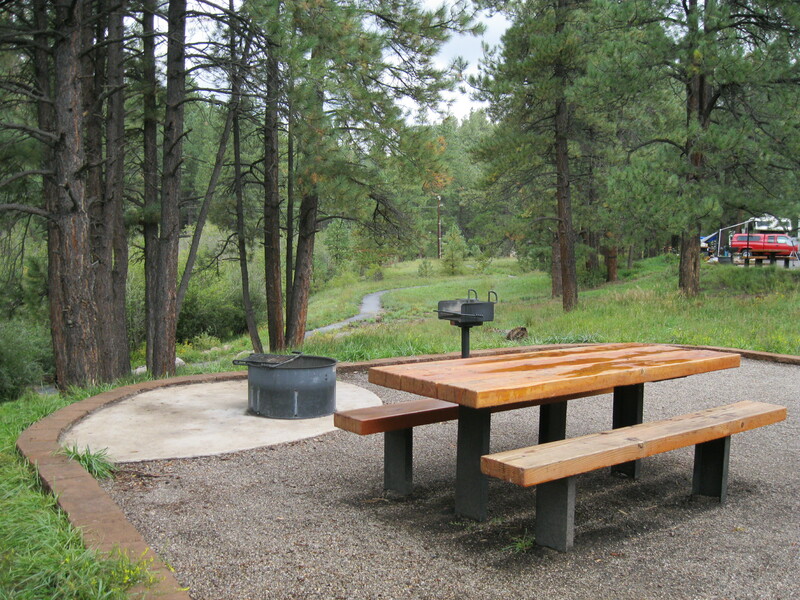 Jemez Falls Campground (one loop) and Picnic Area will be open for Easter Weekend (April 17-24) and then closed until May 15th…at which time it will reopen for the balance of the summer season. San Antonio Campground will open for the summer season on May 15th. 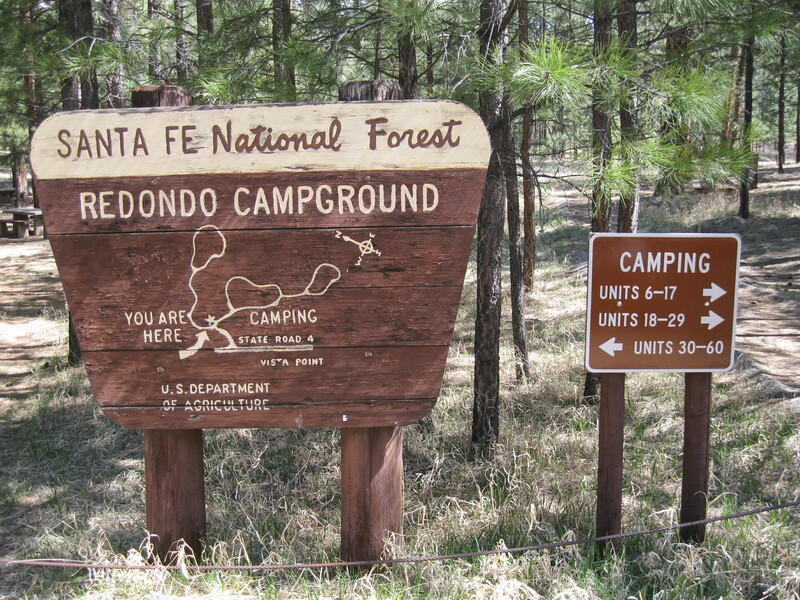 Redondo Campground is one of a few first come, first served campgrounds in the Jemez and will be open this year for the Memorial Day Weekend only. This popular campground will be closed for the balance of the season in order to facilitate the installation of new toilets within the campground. Vista Linda Campground is open year-round. 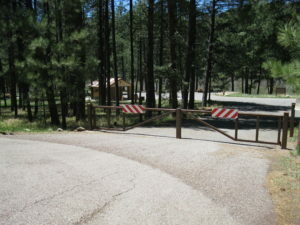 Paliza Campground (located past Ponderosa off Forest Road 10 via NM Hwy 290) will be open May 15th and throughout the balance of the season. Both of these campgrounds are first come, first served. 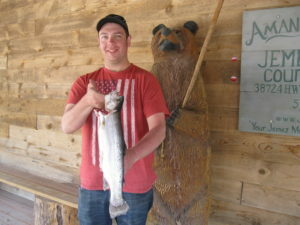 Fenton Lake State Park is open for fishing and camping ( 36 campsites) with most of those being first come first served. Fenton is a very popular destination and is almost always full on the weekends. While there will be a limited supply of non reservation campsites in the Jemez this summer, the forest roads within the Santa Fe National Forest are always a good bet for dispersed camping, which means no bathrooms, no picnic tables and no cost…and usually more elbow room. 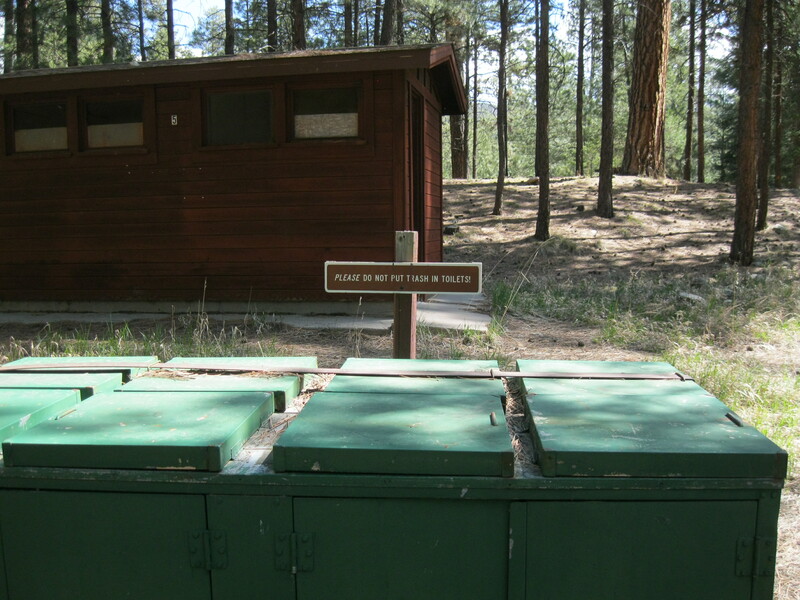 Please be prepared to ‘pack it in, pack it home’ (trash), as the forest service does not provide for trash disposal in the dispersed areas. Please continue to consult this web page for up to the minute information with regard to recreation in the Jemez Mountains and any possible fire restrictions. For the first time in many years, Redondo Campground is fully open for public use. This campground, with its 60 sites, is an extremely valuable resource for the camping public. 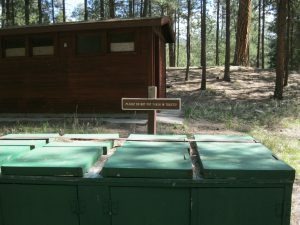 Amenities include fire rings, picnic tables, bathrooms and trash bins. There is no water within this campground and although there are no pull through sites, Redondo Campground will accommodate RV’s up to 30 feet in length. No hook ups are available. 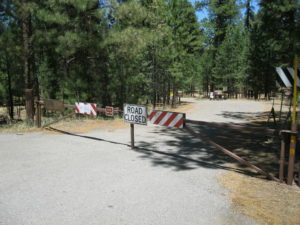 For the last several years, due to Federal budget restraints, this Forest Service Campground has been closed. My thanks to new District Ranger, Eric Taylor (and others) who are responsible for getting this done. Not only is it open, but it is open early. 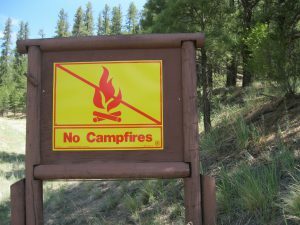 Normally, the Forest Service Campgrounds within the Jemez Ranger District, do not open until mid May. Redondo Campground is perhaps my favorite campground in the Jemez. 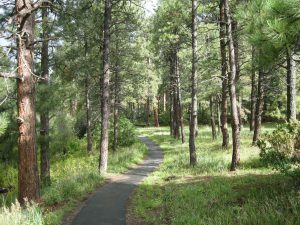 Even though it has sixty sites available, they seem isolated, with towering ponderosa pine providing shade and intoxicating smells of the forest. Additionally, Paliza Campground (Forest Road 10) will be open this summer for the first time in many years. Also Jemez Falls Campground is receiving needed repairs on its’ well system and will have potable water available when it opens in May. 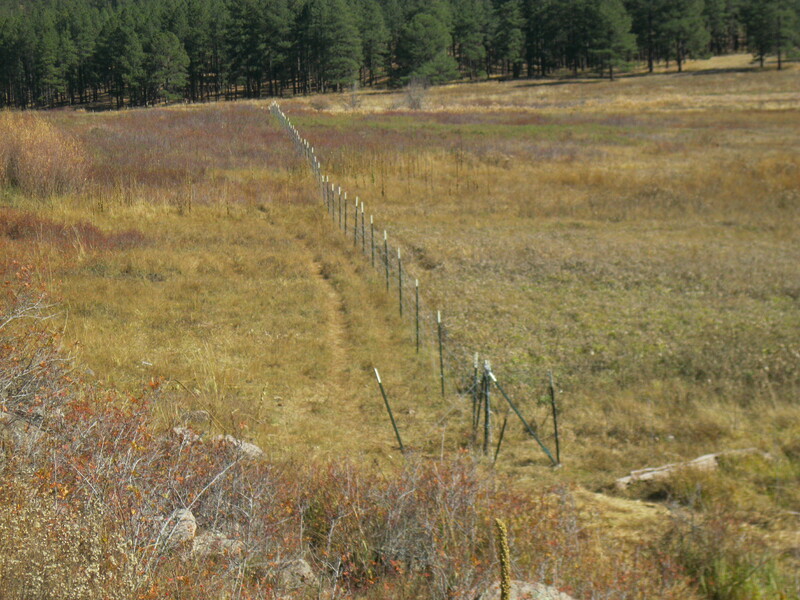 Once again, thank you to the Jemez Ranger District for making this part of the Santa Fe National Forest much more available to the public. 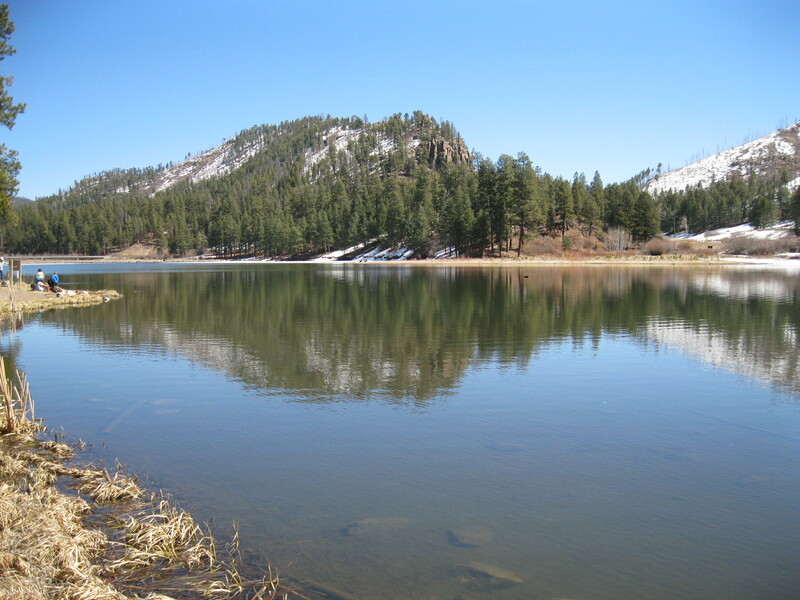 With various school districts on spring break and warm, sunny weather predominate…the Jemez Mountains will be quite the attractive destination over the next few weeks. While I certainly do not wish to discourage any visitors to the Jemez (or Amanda’s Country Store), there are some things you need to be aware of prior to your visit. First of all, the positive. Right now, and really the next couple of months, is the best time to fish the Jemez. While some streams may be swollen with spring run-off, there is always somewhere to find optimal conditions. Check out our Jemez Fishing Report section for specific fishing recommendations. The best fishing of the year at Fenton Lake is right now. The winter ice has just come off the lake and the holdover rainbows, browns and cutthroats are voraciously hungry. Some may be in the 16 to 20″ range. All baits, flashy spoons and spinners and large streamer flies will all be effective. hot springs and other destinations. The Forest Service tries to have most forest roads open by April 1st to accommodate the spring turkey hunters, but that may be difficult this year, with many roads still covered with snow. With forest roads being closed, camping opportunities will be somewhat limited. 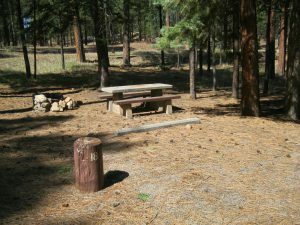 Vista Linda Campground at mile post 13 on Hwy 4 has 13 spots open and Fenton Lake State Park has six spots open…all first come first served. Even though camping opportunities will be limited, we can direct you to some lesser known areas. Please stop in the store and we will direct you. To summarize, while conditions at lower elevations may feel like spring or even summer like, that may not be the case here in the high country of the Jemez mountains. 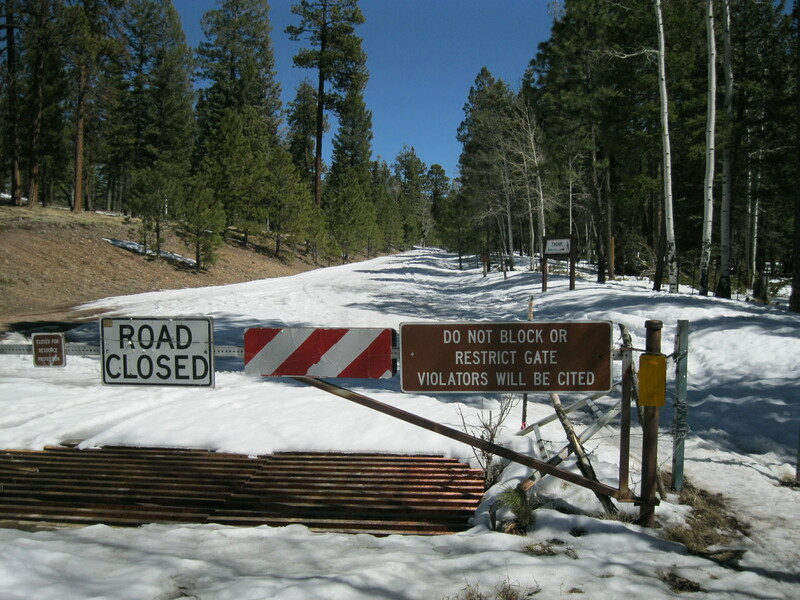 Be aware that camping may be difficult…nighttime temperatures cold…roads closed, muddy or snowy…and improved campgrounds limited. 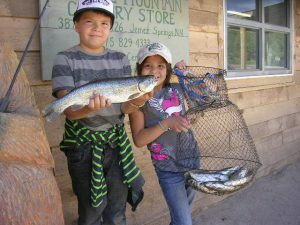 That being said, fishing is terrific and the Jemez Mountains are always conducive for creating family memories, so load up Grandma and the kids and come visit us this spring break. 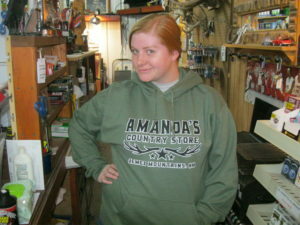 Be sure and stop in to Amanda’s Jemez Mountain Country Store. We really appreciate your business. Well, it’s not nearly as intrusive as I thought it was going to be. The ‘mouse fence’ that is. I took a drive on FR376 to the south from Hwy 126 last week. It is about five miles to where the forest road first crosses over the Rio Cebolla. It is here that the fence to protect the New Mexico meadow jumping mouse begins. 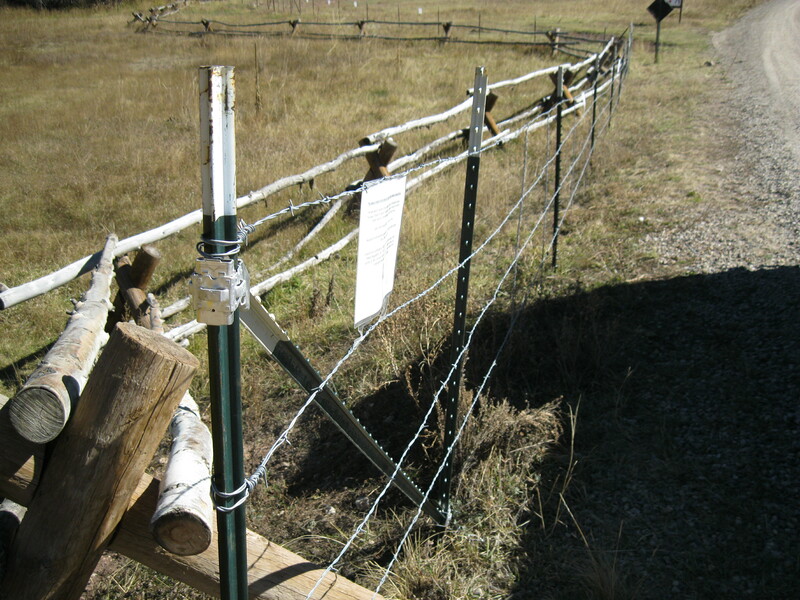 Standing about four feet high and constructed of strands of barbed wire and steel posts, it is meant to keep human recreationists and cattle away from the habitat of the federally protected mouse. Although the mouse has not been seen since 2008 (at least that is what I have heard) Santa Fe based WildEarth Guardians managed to have the mouse added to the federal endangered species list. 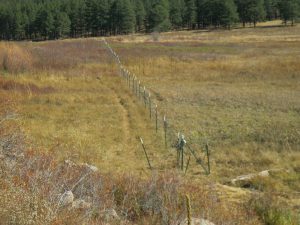 The USDA Forest Service, Santa Fe National Forest was obligated by US Fish and Wildlife to erect the fence to protect the mouse. And so they did. Quickly. 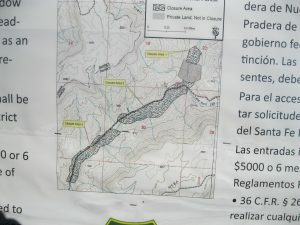 While the closure along FR376 affects only 118 acres… campers, hikers and fisherman will see some of their prime recreation areas fenced and signs promising a $5000 fine if trespassed. The good news is that there are still plenty of familiar and quality camping areas available and miles of stream to fish. Of course there is the forest service ‘Travel Management Plan’ that could be an issue for campers, but that is a whole other story. The San Antonio Campground along Hwy 126 will remain open next summer and will be unaffected by the closure order for the most part. Because it has been determined that sections of the Rio San Antonio, including within the campground, are mouse habitat, the south side of the river through the campground will be closed to humans…but not fenced. The closed areas will be clearly signed so there will be no mistake about what is off limits. While these closures to protect the “mighty mouse” will be noticeable, it could be a lot worse in my opinion. Saturday, September 27, 2014 is National Hunting and Fishing Day and Free Fishing Day throughout New Mexico. No fishing license is required to fish public waters in the Jemez Mountains. All other fishing rules and regulations apply. And, just in time (Tuesday, September 23rd) NMDGF has stocked Fenton Lake with over 2200 catchable sized Rainbow Trout. Fenton has been stocked with about 3700 fish in the last three weeks. Along with the stockers, the lake also holds a nice population of resident Browns and more than a few Rio Grande Cutthroat Trout. Most other waters throughout the Jemez have been recently stocked as well. Check out the stocking report for more detailed information. 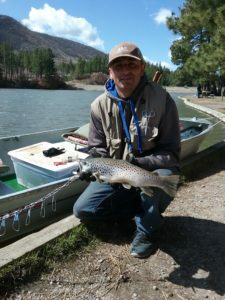 Fenton Lake, Rio Cebolla, Rio de Las Vacas, and the upper Jemez River will offer the best fishing opportunities this weekend. The campgrounds are still open and the forest is in great condition. Come on up this weekend and enjoy what is probably the best time of the year to be in the Jemez. Less people, less bugs, better fishing and fabulous weather…plus no fishing license required on Saturday. Here’s what you need to know if you are planning a last of the season trip to the Jemez Mountains for some Labor Day Weekend recreation. These are the facts with regard to the Pino Fire. This lightning caused fire started over two weeks ago and because of somewhat favorable conditions, the Forest Service decided to manage the fire as a controlled burn, rather than put it out. In fact, because of the moisture present they have been fighting to keep it burning. If you see any smoke at all…you will see signs that say “Managed Burn, Do Not Report”. The fire is a non factor with regard to recreation in the Jemez, in spite of what the miss-informed media might report. 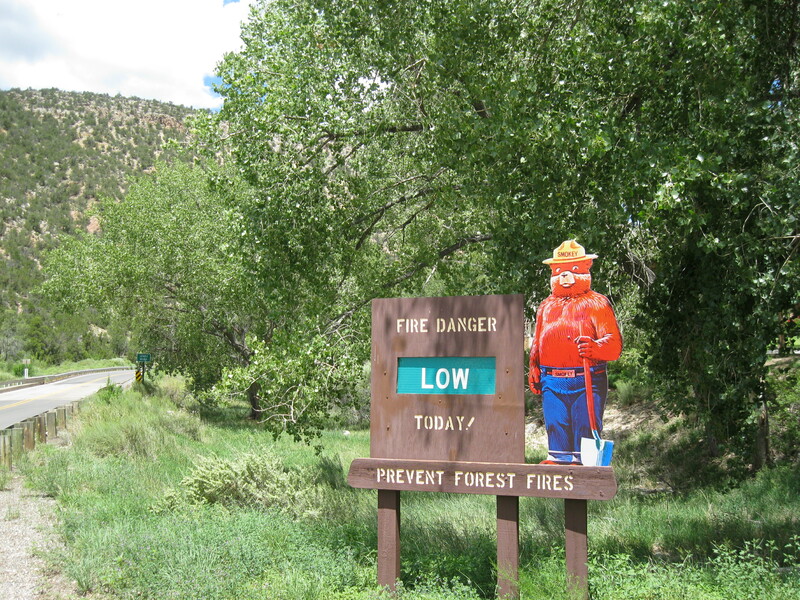 Currently the fire danger within the Jemez Ranger District is rated as “LOW”. I have not seen that in over twenty years at this time of year. The forest is beautiful, lush and green. Wild flowers have gone wild and mushrooms are thick on the forest floor. There are no fire restrictions. Forest roads are dust free. Days will be sunny and warm with perfect, cool nights. The forecast is calling for sunny, dry weather throughout the long weekend. 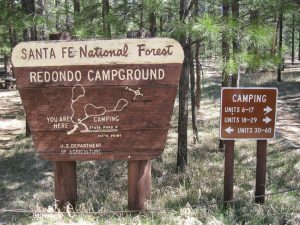 Campgrounds at Fenton Lake State Park, San Antonio, Jemez Falls, and Vista Linda will fill up fast. There are many options for dispersed camping along the forest roads and that is the reason why we stay open late on Friday and Saturday nights. Stop in to Amanda’s and we will help you find that perfect spot.. There is always a place to camp in the Jemez. If you are coming up in a camper or RV please be sure to fill up with water before you come. There are no options for water here in the Jemez. Although Fenton Lake is still not fishing very well right now, there are many good options that will provide for some tight lines. Refer to our stocking and fishing pages for the latest information. We’d love to have you in the forest this weekend and in the store. We need and appreciate your business. However…in the event that you find yourself in Albuquerque for the weekend, I would encourage you to plan to support your hometown University of New Mexico Lobos as they open their football season against the UTEP Miners at University Stadium at 6:00 PM Saturday. GO LOBOS! The ‘Jemez Cliff Jumps’ have long been a popular recreation area for visitors to the Jemez Mountains. The Cliff Jumps are located a mile or so off Hwy 4 (mile marker 32) on the East Fork of the Jemez River. The hike is beautiful and the cliff jump area is spectacular. Varying levels on the cliffs allowed for jumps into the river for both the brave and the timid. Having said all of this, cliff jumping in the Jemez is currently a thing of the past. First of all…the forest is open…completely. We finally had some widespread rain last night (Wednesday July 2nd) that settled the dust, lessened the fire danger, freshened the air and put a damper on the Diego Fire about fifteen miles to the northwest. The Jemez Mountains are beautiful right now and will continue to blossom as the July rains continue. In spite of the recent moisture, Level I Fire Restrictions remain in place. Campfires and charcoal are allowed in designated campgrounds only. Propane grills and stoves are OK in dispersed camping areas. It seems to me that there are far fewer folks camping this three day weekend…certainly less than normal. All forest roads are open, including FR376 north to the San Antonio Hot Springs. Camping, hiking, hot springs, fishing and relaxing with family and friends in the cool mountain air are all here for your enjoyment. Fishing has slowed considerably the last few weeks. NMDGF has curtailed most stocking activity until water quality improves. Anglers are still catching fish however. I am willing to share my favorite time of year in the Jemez, so come on up and enjoy all that the Jemez Mountains have to offer. For the latest fire information, go to inciweb.org. The Diego Fire is located in the SFNF Coyote Ranger District. I normally do not comment on incidents outside the Jemez Ranger District, but because of the high visibility of the smoke from this fire in the La Cueva, Fenton Lake area, I feel the need to inform. 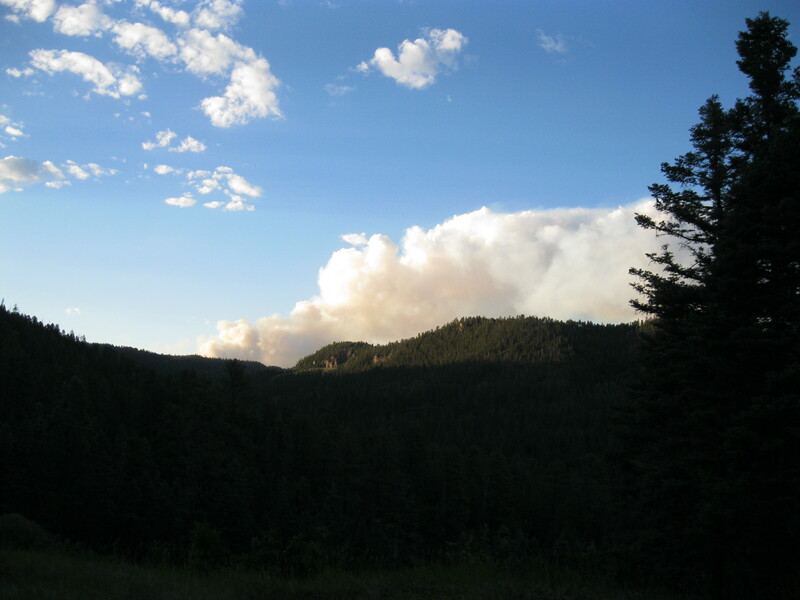 This fire is located approximately twenty miles north of La Cueva and threatens none of the recreational areas within the Jemez Ranger District. Other than smoke in the far distance and the occasional air tanker overhead, there is no evidence of this fire. It is business as usual here. As of 3:00 pm Sunday, June 14th, the Diego Fire had grown to 200 acres. The fire was lightning caused and was first detected earlier last week. No structures are threatened and the fire remains on Federal lands. The closest private lands are approximately one mile from the fire. It is burning primarily dead fuels. Closer to home, another fire broke out Sunday afternoon above the Seven Springs Fish Hatchery just off Forest Road 314. This fire was caused by a tree coming in contact with a power line and was quickly suppressed and contained at approximately one acre. Soaking rains are hoped for… and forecast for the middle of this week. From the USDA Forest Service, Santa Fe National Forest. “Santa Fe national Forest and Valles Caldera National Preserve remain in very high fire danger, despite recent rains. Grasses and other small fuels have dried out enough to carry fire; larger fuels, such as logs, are exceptionally dry and able to burn. The extended weather forecast calls for continued dry and windy conditions. All of these factors raise the potential for both human and lightning-caused fires. 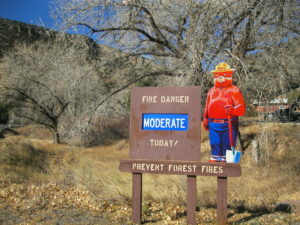 To ensure public safety and to provide the highest degree of protection to forest resources, Level 1 Fire Restrictions will be implemented on all National Forest System lands within Santa Fe National Forest on the Jemez Ranger District and Cuba Ranger District south of NM Highway 126, and the Valles Caldera National Preserve, in Sandoval County. This order will begin at 8:00 AM on June 12, and remain in effect until…rescinded. 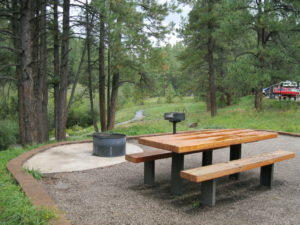 Campfires, charcoal grills, and stove fires are prohibited except in established fire pits, in developed campsites and picnic areas. Pressurized liquid or gas stoves, lanterns, and heaters are allowed. Smoking is only allowed in enclosed vehicles or buildings, developed recreation sites, or in areas at least three feet in diameter that are clear of flammable material. Possessing, discharging, or using any kind of fire work or other pyrotechnic devise.